I am still not able to use the EN Web clipper in Firefox for Mac. The web clipper icon has a red dot on it. 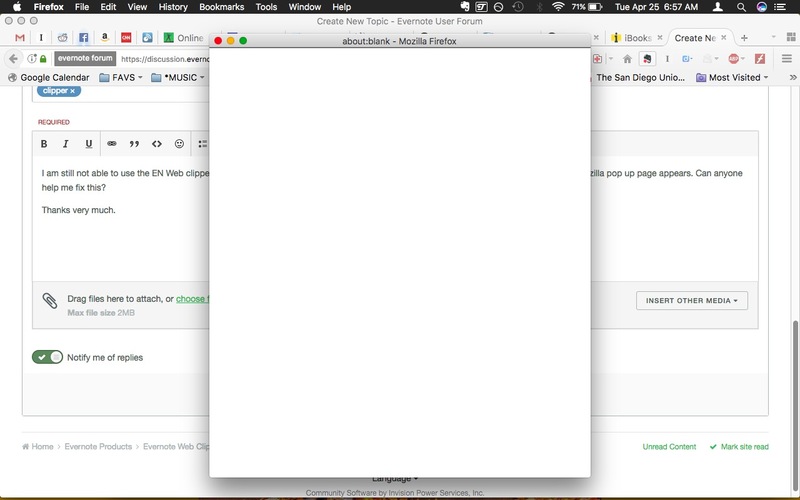 When I click on the icon, a blank Mozilla pop up page appears. Can anyone help me fix this? I've been having the same problem for the last week or so. Super frustrating. I need to work! Hi. Have you tried uninstalling and reinstalling the Clipper? I use Firefox and (currently) Clipper 6.10.2 without any problems. Later today, when I returned to my computer, the red dot was gone, and the Clipper now works. But I will remember your suggestion for the future. This is been happening on one of my Macs for a while. I have removed and reinstalled the Clipper but it doesn't help. I'm running Web Clipper 6.10.2.0 and Firefox 53.0.2. I'm still having the problem. I just upgraded Flash to the same version and removed and reinstalled the Evernote Web Clipper but I still get the red dot on the icon and the blank login screen that was originally reported. I have had this problem for days, and finally fixed it. In Firefox>Preferences>Privacy, I had Accept Third-Party Cookies set to "Never". When I changed it to "From Visited", the Web Clipper immediately fixed itself. I have seen similar results posted about Safari and Web Clipper. Even if you don't want to leave the setting at "From Visited" you can at least figure out why Web Clipper has been acting up and make a decision based on that. Change History to "Firefox will: Use custom settings for history"
I already had Accept third-party cookies set to Always, so I looked further. Click on the Exceptions... button. I had lots of exceptions in here. The list isn't searchable so I reluctantly hit Remove All Sites. I restarted Firefox and after that the Web Clipper worked fine. I'll rely on Privacy Badger for my cookie management. Interesting, beirne! I already had put in an Exception for www.evernote.com in the Exceptions box, but that alone had not solved the problem. Without changing the Exceptions, but changing the Third-Party cookie setting to "From Visited" all was fixed. Glad you got yours working again. Having to loosen privacy settings to use the Web Clipper is... not cool. Saving cookies should not be necessary to save a ***** web page. It clearly wasn't necessary before, so why is it now? -We're a (mainly) user-driven forum. Evernote staff don't usually respond to individual queries here, though they will in private messaging. Since there's no point to Evernote making changes unless there's a good technical reason, or the issue was forced by process changes introduced by Microsoft (or whoever giverns cookies) all we can do is pick one. If you want clipper to work, you need to allow cookies. Well, I faced the same issue. Changed the 3rd Party cookie setting in Firefox to "Allow from Visited" after having cleared all my cookies first. Not a great solution but it works without having to allow all 3rd Party cookies. I was having similar problems and changed the setting to "From Visited". It worked perfectly after that.